When a product has more than 5,000 5-star reviews on Amazon, you know it has to be a pretty fantastic product. Considering all the reviews out there you see that give products bad ratings for stupid reasons like people not being able to figure out how to do something simple, it takes something special to be able to make that many people happy. 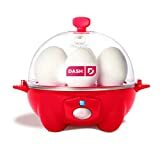 Well, the Dash Rapid Egg Cooker is definitely something special. This little kitchen gadget cooks up to a half-dozen eggs at a time, and it can cook in a variety of different styles. Pop in your eggs, press a single button, and you’re done — Dash’s device will cook your eggs perfectly and then keep them warm until you’re ready to eat!